Contributing author. Baker Illustrated Bible Dictionary. (Ed. Tremper Longman III. Grand Rapids: Baker, 2013). 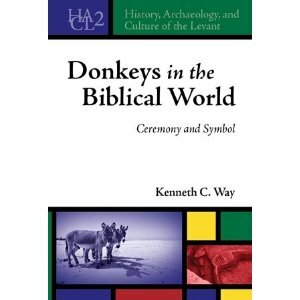 Donkeys in the Biblical World: A Ceremonial and Symbolic Study (Winona Lake: Eisenbrauns, 2011). “The Literary Structure of Judges Revisited: Judges as a Ring Composition” in Windows to the Ancient World of the Hebrew Bible: Essays in Honor of Samuel Greengus, eds. B. T. Arnold, N. L. Erickson and J. H. Walton, pp. 247-260 (Winona Lake: Eisenbrauns, 2014). "Mari Archive” in the Lexham Bible Dictionary (Bellingham: Logos Research Systems, 2014). Thirty-two entries (5,000 words) in the Baker Illustrated Bible Dictionary edited by T. Longman, P. Enns and M. Strauss (Grand Rapids: Baker, 2013). "Assessing Sacred Asses: Bronze Age Donkey Burials in the Near East" Levant 42/2 (Nov 2010):213-228. “Donkey Domain: Zech 9:9b and Lexical Semantics” Journal of Biblical Literature 129/1 (2010): 105-114. “Animals in the Prophetic World: Literary Reflections on Numbers 22 and 1 Kings 13” Journal for the Study of the Old Testament 34/1 (2009): 47-62. “The God of Noble Character? Proverbs 31:10-31 in Context” Biola Magazine (Spring 2009: 39). “Archaeology: What It Can And Can't Do For Old Testament Studies” Sundoulos (Fall 2008): pp. 2-7. “Balaam's Hobby-Horse: The Animal Motif in the Balaam Traditions” Ugarit-Forschungen 37 (2005 Volume - Stanislav Segert in memoriam): 679-693. “Jehoshaphat” in Dictionary of the Old Testament: Historical Books, eds. Bill T. Arnold and H. G. M. Williamson (Downers Grove: InterVarsity Press, 2005) pp. 531-534.
Review of S. Frolov, Judges. FOTL 18 (Grand Rapids: Eerdmans, 2013) in Review of Biblical Literature 12/2013. Review of “Psalms in Community: Jewish and Christian Textual, Liturgical, and Artistic Traditions”, eds. H. W. Attridge and M. E. Fassler (Society of Biblical Literature, 2003) in the Journal of the American Oriental Society 127/1 (2007): 108-109.
Review of L. Allen and T. Laniak, “Ezra, Nehemiah, Esther, NIBC” (Peabody: Hendrickson, 2003) in the Journal of the Evangelical Theological Society 47/4 (December 2004): 706-708.
Review of M. Fishbane, “The JPS Bible Commentary: Haftarot” (Philadelphia: JPS, 2002) in the Journal of the Evangelical Theological Society 46/2 (June 2003): 334-336.
Review of E. Stern, “Archaeology of the Land of the Bible”, vol. II: The Assyrian, Babylonian, and Persian Periods, 732-332 BCE (New York: Doubleday, 2001) in the Journal of the Evangelical Theological Society 45/4 (December 2002): 688-689.